Funeral Donations - Should you give money at a funeral? Do You Give Money At A Funeral? Attending a funeral is a sad and often traumatic experience for the family, friends and colleagues. Most people do not attend funerals on a regular basis and are often unsure of the protocols involved. One of the many questions asked is - Should I give money at a funeral? The answer is usually - No. It is not an appropriate gift. As always in life, protocols are not set in stone and there are ways to give money if you feel the need. Here are some ideas on offering money and other appropriate memorial gifts before, during or after a funeral service. Many families find themselves in a position of financial stress after a death and giving money does make sense. Perhaps the breadwinner has passed on and the spouse is not yet in a place to work. In this case, friends, colleagues and family can pool contributions together and create a fund that can be accessed at a later stage. It is best not to hand the money over at the funeral. A sympathy card with a message informing the bereaved of the details of the fund can be given. Arranging a funeral comes at a cost and if the family cannot afford this, then giving money to help defray the costs will be much appreciated. The handing over of this money should be done in conjunction with the family spokesperson, prior to the funeral. This allows the money to be used to pay for the immediate expenses. If the family has indicated a direct need for financial support, then you can feel free to offer money. Make a deposit into a bank account or offer cash prior to the funeral. Although gift vouchers are in fact money, they are perceived in an entirely different way from hard cash. Offering a gift voucher can significantly help a family under financial stress. Clothing, food, toiletries and day-to-day basic necessities can be bought using vouchers, taking away the immediate pressure of making ends meet. You don't have to offer a lot of money; a small amount goes a long way. If you are close to the family and able to offer substantial financial help, you could choose to pay school fees, home rent or transport costs to tide them over this difficult time. Very often, the bereaved name a charity, cause or organization in lieu of bringing flowers to a funeral. This makes it easy for friends to donate money and offers you a way of contributing. If a charity has not been named, you can choose one that you feel is appropriate. Perhaps the deceased loved animals - you can donate to a local animal rescue center. Perhaps the deceased loved books – donating to a local library will be a rewarding experience. 4) How do you physically give the money? If you have established that the family would appreciate receiving money – how do you actually do this? Getting in contact with a family spokesperson before the funeral is a good idea. In today’s electronic age, you can then get bank details and make a deposit directly into their bank account. You would need to inform the appropriate people. A discreet way to do this is to offer a sympathy card at the funeral and include the details of the deposit inside the card. If the banking option is not available, you don’t want to be seen handing over physical cash notes, a personal check or an envelope filled with money. Place the notes or check inside a lovely sympathy card. Add a meaningful message and it will be found when the bereaved read their cards at a later stage. At some funerals, the family spokesperson may have arranged with the funeral director or minister that money donations are expected. He will then be the person to hand the money to. 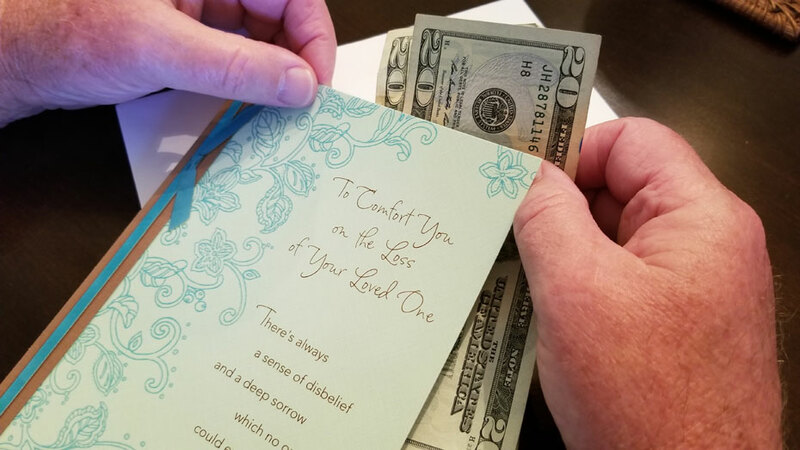 Make an effort to find out before approaching a grieving family member and handing them a financial gift that they won’t know what to do with at that moment. 5) How much should you give? You have decided to give money and now the question arises – how much? There are no rules here. Any amount will be appreciated by a family in need. Only give what you can afford. For work colleagues, people in the community and others not particularly close to the deceased, you can equate the value to the cost of a bouquet of flowers, and then offer a similar amount. Remember that it is the thought that counts and not the amount of money. You do need to make an effort in this case. You may be under pressure in your day to day life and find it easier to place some notes into an envelope stating that it is for the nominated charity or institution. This is not a good idea. The bereaved family is already under stress and doing this will only add to their burden and work load in a time of sadness.7) When should you donate? The answer is as soon as possible. If for some reason you were unaware, unavailable or unable to attend to this, make your money donation as soon as possible after the funeral. The family will start attending to Thank You notes within a week or so and yours may go unnoticed if it arrives too long afterwards. Are you attending a funeral of a friend or colleague who belonged to a different culture or religion? If possible, try to make contact with the family spokesperson to find out what the appropriate procedure is. At Chinese funerals, for example, the giving of money is acceptable and is known as ‘White Gold’. The money is placed into a white envelope and handed to a member of the family either before or after the funeral. Your envelope will be received with a Chinese, Cantonese or Mandarin phrase that roughly translates as ‘you are very considerate’ or ‘you have heart’. Saying ‘Thank you’ is seen as part of a celebratory event and will not said at a funeral. Memorial and funeral gift ideas. Flowers are usually well received at funerals, memorials and at the home of the deceased. You can bring along a single flower or a sympathy bouquet. But, keep in mind that for some religions, flowers are not accepted. Orthodox Jewish funerals are not the place to send flowers. Flowers are not usually sent to a Catholic church either but they can be sent to the funeral home. Flowers and their colors have symbolic meanings. Take some time, do some research and choose a thoughtful flower that would have special meaning to the deceased or the family. There is a large choice of memorial gifts available today, both online and in the stores. 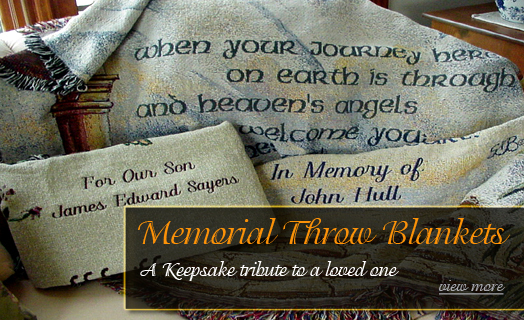 Choose a memorial blanket and personalize with embroidered thoughtful words that have special meaning. Guardian Angel ornaments can be hung up in the home as a source of comfort. You can choose religious statues of all types. For a personal gift, Guardian Angel wings on a locket or other piece of memorial jewelry makes a wonderful gift idea. If you knew the person well, a lovely memorial frame with the picture of the deceased will be treasured. Food is always appreciated, especially in homes where finances are stretched. Offer homemade staples, a hot meal or treats that will bring comfort to the mourners. Bring food in disposable containers so that the family do not need to worry to return them after the event. Finger foods work well as they are easy to deal with while standing. Don’t forget to include some paper plates and napkins. Do not arrive with a massive gift that the family will have trouble transporting or storing. They have enough on their minds during this difficult time and lugging huge gifts around will only add to their stress. If you want to offer a large gift, arrange to have it sent to the home before or after the funeral. Sympathy Cards are probably one of the most meaningful gift ideas. They can be kept for years afterward as a memento and treasured by the family. We offer a wonderful range of condolence messages and cards, ideal for all types of people. Very few of us are skilled in writing condolence messages and struggle when faced with a situation like this. These suggestions will help you find the correct words to say, offering comfort to a grieving friend, family member or loved one. Inspirational sympathy throws and blankets are permanent remembrances of a loved one and provide warmth during trying times. Condolence throws are a visual expression of love, sympathy, and respect. They are means of lending support and sharing the burden of grief.